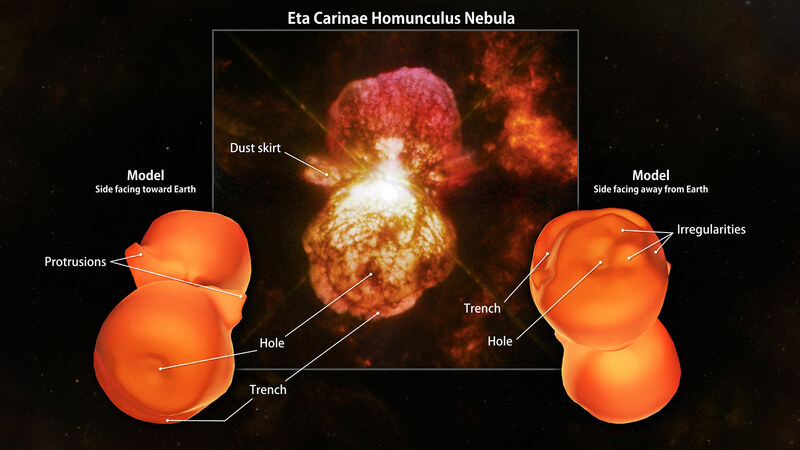 Using new data from the European Southern Observatory’s Very Large Telescope and its X-Shooter spectrograph, astronomers have created the first full 3D model of Eta Carinae Nebula. 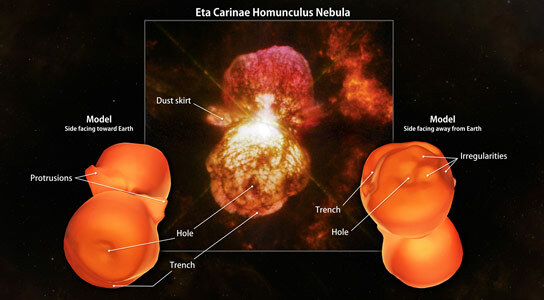 In the middle of the 19th century, the massive binary system Eta Carinae underwent an eruption that ejected at least 10 times the sun’s mass and made it the second-brightest star in the sky. Now, a team of astronomers has used extensive new observations to create the first high-resolution 3-D model of the expanding cloud produced by this outburst. Eta Carinae lies about 7,500 light-years away in the southern constellation of Carina and is one of the most massive binary systems astronomers can study in detail. The smaller star is about 30 times the mass of the sun and may be as much as a million times more luminous. The primary star contains about 90 solar masses and emits 5 million times the sun’s energy output. Both stars are fated to end their lives in spectacular supernova explosions. Between 1838 and 1845, Eta Carinae underwent a period of unusual variability during which it briefly outshone Canopus, normally the second-brightest star. As a part of this event, which astronomers call the Great Eruption, a gaseous shell containing at least 10 and perhaps as much as 40 times the sun’s mass was shot into space. This material forms a twin-lobed dust-filled cloud known as the Homunculus Nebula, which is now about a light-year long and continues to expand at more than 1.3 million mph (2.1 million km/h). Using the European Southern Observatory’s Very Large Telescope and its X-Shooter spectrograph over two nights in March 2012, the team imaged near-infrared, visible and ultraviolet wavelengths along 92 separate swaths across the nebula, making the most complete spectral map to date. The researchers have used the spatial and velocity information provided by this data to create the first high-resolution, fully 3-D model of the Homunculus Nebula. The new model contains none of the assumptions about the cloud’s symmetry found in previous studies. The shape model, which is now published by the journal Monthly Notices of the Royal Astronomical Society, was developed using only a single emission line of near-infrared light emitted by molecular hydrogen gas. The characteristic 2.12-micron light shifts in wavelength slightly depending on the speed and direction of the expanding gas, allowing the team to probe even dust-obscured portions of the Homunculus that face away from Earth. “Our next step was to process all of this using 3-D modeling software I developed in collaboration with Nico Koning from the University of Calgary in Canada. The program is simply called ‘Shape,’ and it analyzes and models the three-dimensional motions and structure of nebulae in a way that can be compared directly with observations,” said lead researcher Wolfgang Steffen, an astrophysicist at the Ensenada campus of the National Autonomous University of Mexico. The new shape model confirms several features identified by previous studies, including pronounced holes located at the ends of each lobe and the absence of any extended molecular hydrogen emission from a dust skirt apparent in visible light near the center of the nebula. New features include curious arm-like protrusions emanating from each lobe near the dust skirt; vast, deep trenches curving along each lobe; and irregular divots on the side facing away from Earth. Every 5.5 years, when their orbits carry them to their closest approach, called periastron, the immense and brilliant stars of Eta Carinae are only as far apart as the average distance between Mars and the sun. Both stars possess powerful gaseous outflows called stellar winds, which constantly interact but do so most dramatically during periastron, when the faster wind from the smaller star carves a tunnel through the denser wind of its companion. The opening angle of this cavity closely matches the length of the trenches (130 degrees) and the angle between the arm-like protrusions (110 degrees), indicating that the Homunculus likely continues to carry an impression from a periastron interaction around the time of the Great Eruption. Once the researchers had developed their Homunculus model, they took things one step further. They converted it to a format that can be used by 3-D printers and made the file available along with the published paper. 2 Comments on "Astronomers Create First Full 3D Model of Eta Carinae Nebula"
Do you have a link to the 3D printer model? Seconding the request for the 3D printer file. What good is a nebula if I can’t hold it in my hand?